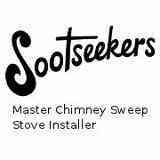 Sootseekers - Chimney Sweep, Fireplaces/Stoves based in Poole, Dorset. Sootseekers Chimney Sweep is a family run business, a member of the Guild of Master Sweeps and Hetas registered in sweeping and stove installation. My services include traditional brush and vacuum and now also the more modern power sweep (details of which can be found on our website – www.sootseekers.co.uk). Both methods include smoke test and certificate on completion. We undertake all aspects of chimney and stove maintenance/cowl fitting etc. My aim is to always offer a clean, reliable, friendly service so that my customers are left in no doubt that Sootseekers was the right choice for them. If you require an appointment or quote, do not hesitate to contact us. Please note that all calls will be returned if left as a message on the answering machine during busy periods.